Music and exercise, you say. If these things sound like night and day to you, well you haven’t thought much about it. Think about dancing – one of the most popular and visceral hobbies and skills a person can know – which incorporates both of these things! But even regular exercise can be affected by music.Many runners have stated that they run worse without music – some surveys estimate the rate to be over three quarters. The USA Track & Field ban on wearing portable music players caused an uproar, but the rationale was simple – to prevent runners from having an edge. So obviously, music can and does give runners an edge. After all, it is a known fact that listening to music even in a relaxed state increases the electrical activity in the brain both in auditory areas, but also in those responsible for movement. It appears that movement and sounds are well interconnected inside of our brains. Many runners have stated that they run worse without music – some surveys estimate the rate to be over three quarters. The USA Track & Field ban on wearing portable music players caused an uproar, but the rationale was simple – to prevent runners from having an edge. So obviously, music can and does give runners an edge. After all, it is a known fact that listening to music even in a relaxed state increases the electrical activity in the brain both in auditory areas, but also in those responsible for movement. It appears that movement and sounds are well interconnected inside of our brains. The effect is not confined just to amateurs. One of the best sprinters around, Michael Phelps, is known to exercise to very, shall we say, aggressive rap tunes, stating that it helps improve his performance. There are various reasons for this interesting effect. Fortunately, now we know much more than in the previous decade. The amount of research has swelled as the streaming music providers aim to tailor their playlists for optimal enjoyment. If you’ve ever played a playlist tagged “pump up” or “exercise”, then you’ll know that we’re talking about. It appears that when people play music during exercise, it has a distracting effect on them and increases their heart rate. They feel less pain and fatigue and can carry on working out for longer. Music is a good mood elevator. There is a real reason for that. When listening to music, your brain releases endogenous opioids that enhance your mood and raise your pain threshold. People who listen to music while exercising routinely rate their exercises as more enjoyable than those who do not. Most people markedly improve their performance – most often unknowingly – when exercising to music, sometimes even by more than 20 percent! The effect is most prominent during cardio exercises of moderate intensity. It’s much less useful when partaking in anaerobic exercise, where your muscles are stressed-out to the max. That’s understandable – it’s much harder for your brain to distract you from the distress signals your muscles are sending. Some ascribe the motivational effect of music as putting you ‘in the zone’. It’s the zone where everything else around you becomes unimportant. It’s only you, the road and the aim of making the best time possible. It’s the purest form of motivation, bar none. It occurs when you listen to a tune that is not only appropriate to the occasion, but also strikes an emotional chord. It’s the uplifting and motivational songs that do it, usually. What Genre Should I Choose? The choice of music is important. There are no hard and fast rules, as musical tastes differ. However, research has shown that the most popular genres of music for exercise are hip-hop, pop and rock. The tempo of music depends on the type of exercise you do. It appears that 120 bpm (beats per minutes) sounds the best to us, but for exercise faster bpm’s of 140 to 160 bpm are recommended. Rap seems to be popular due to fast-spoken lyrics, which gives the effect of speed even with a rather gentle beat.What About the Volume? You might feel the urge to crank it up to eleven to get groovin’, but we advise you against it. Not only is loud music dangerous when listening on headphones, but it’s doubly so during exercise. The blood flow to the brain and the inner ear is increased during physical exertion, making your hair cells more sensitive and susceptible to damage. Some experts suggest that every few sessions, you should exercise without music. This will plant your feet on the ground and increase your awareness of the surroundings. Besides getting you all pumped up and ready to exercise, music can be a lot more involved in the way you exercise. 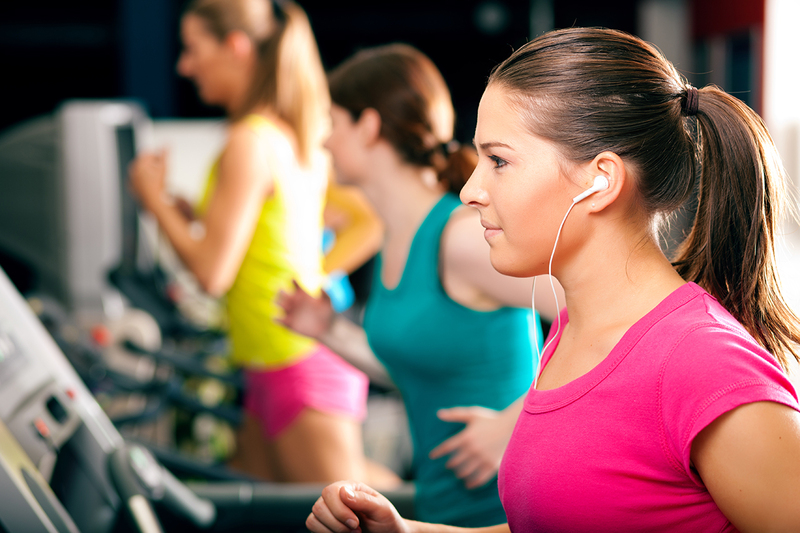 By choosing the right song, it can help you get into the rhythm of exercising along with the music. This will speed you up and you’ll feel much more satisfied. The neurons in your brain literally synchronize with the tempo of the music, which aids when performing repetitive motions.Music then serves as a metronome, which helps your body adjust its movement to the song, thereby using energy more efficiently – you’ll tire slower and get the most from your exercise session. And if you’re having trouble sleeping after a workout, a slow, easy-listening track is what you need. Music then serves as a metronome, which helps your body adjust its movement to the song, thereby using energy more efficiently – you’ll tire slower and get the most from your exercise session. And if you’re having trouble sleeping after a workout, a slow, easy-listening track is what you need. Looking at all the available evidence, it appears that exercising to music is immensely beneficial. It’s definitely a thing to try if you haven’t done so already. We suggest trying out the internet radio playlists featuring exercise music, but even simple Youtube lists can do. If you find out it’s not working for you, that’s okay. But it might just be the key to motivate some of us to reach new heights. Oh and by the way, always be careful if you’re listening to music in traffic. It’s best to exercise caution – accidents are no fun!